It’s that time of year when we need to think about our annual funds for next year! Ten years ago, we started The Black Earth Institute (BEI) with a great idea—the development of a progressive think tank to bring artists and scholars together to explore the intersections of spirituality, the earth and social justice. Patricia Monaghan, an award winning scholar and poet, and I co-founded BEI to foster exchange among artist fellows interacting with scholars and scientists for a three-year term. Our fellows and scholars extend BEI’s mission through their highly regarded creative and successful work. 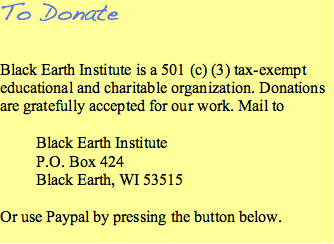 Will you help us continue our work with a tax-deductible gift to Black Earth Institute? Earth Institute move forward — expanding the fellows program, publishing future issues of About Place and a print anthology of About Place contributions. Here’s how your dollars will help us: All contributions until Dec. 31 will be matched and thus doubled. $2000 will support an entire issue of About Place; $500 supports a fellow for a year; $300 covers travel to the retreat. Or you can contribute any amount to support the general activities of BEI. Staffing beyond occasional volunteers also incurs real costs. The future of Black Earth Institute looks bright. Fellows have shown great enthusiasm for the mission and for our work. They volunteer their time to write and speak about our mission. We look forward to choosing six new fellows, publishing two issues of About Place and hosting our annual retreat. Your tax-deductible contribution will help us continue Patricia’s great vision. We look forward to hearing from you. Recently Published in Local Ground(s) Midwest Poetics is a piece the the co-founder of the Black Earth Institute Patricia Monaghan wrote in 2011 telling the story of how BEI came to be. On election day, 2004, I had a life-changing encounter. I was on a cold Madison street corner, holding up campaign signs for the liberal candidate, when I was approached by a gentlemanly fellow. “Don’t you want to vote for the one with values?” he asked, his voice soft and not unfriendly. [learn_more caption=”Read More”] That evening, as my public-health physician husband Michael McDermott and I watched the depressing election returns come in, we talked about “values voters” like the man on the Madison street corner. Somehow, it seemed, such voters did not perceive “values” in the social justice, environmental, and peace movements. Michael, who had been studying the influence of conservative think tanks on American politics, heard echoes of the “talking points” provided by such institutions in what ordinary Americans were saying. Those points included a perception that conservative politicians stood for “values,” while liberal ones did not. Heavily funded think tanks fund commentators to disseminate conservative viewpoints, often in an orchestrated fashion, to the media. Many studies over the last decade have shown that these think tanks provide a disproportionate number of “analyses” in the mainstream media. Media critic Eric Alterman describes the combined influence of corporate wealth and conservative think tanks by telling us that in recent decades…right-wing billionaires like Richard Mellon Scaife, Rupert Murdoch, the Coors brothers, and, more recently, the Koch brothers have joined together with multinational corporations to shift the center of political gravity in our debate rightward on matters of economic, military, and social policy… At the same time, the growth of right-wing talk radio, cable news, and a bevy of well-funded think tanks like the Heritage Foundation, the American Enterprise Institute, the Cato Institute, the Manhattan Institute, and the Hoover Institution at Stanford University have overwhelmed what remains of their less ideologically committed counterparts, such as the Brookings Institution and the Carnegie Corporation of New York, to say nothing of the advantage they enjoy over genuinely liberal organizations such as the labor-backed Economic Policy Institute and the more recently created Center for American Progress. First we forged a mission statement, which called for art to connect with both society and spirituality, as found in most traditional cultures. The ancient Celtic bard, for instance, was not only a skilled wordsmith but was charged with monitoring the relationship of the king to the land. Should the king become corrupt, the results would be instantly apparent in weather disturbances, crop failures, and cattle diseases. In the face of such ecological distress, the bard had to create a satire so perfectly phrased that it magically caused the king to become disfigured. As a disfigured king could not rule, he would be forced out and the ecological order restored under a new and better king. But in today’s world, art is connected with commerce and celebrity rather than with magic and spirituality. And political art is, almost by definition, derided as failing to meet the demands of craft. Could artists be brought together to find a new vocabulary, one that encouraged a more traditional and holistic view of art? Once this idea was hatched, we set to work. How to attract top-flight artists to this enterprise? Especially with the “not having much money” stipulation? Undeterred, we made up a list of authors we believed met the criteria of connecting art with spirituality, ecology and social justice, then invited them to a four-day intensive. The site would be our weekend (and someday, retirement) home in Black Earth. The participants would get fed and housed, but otherwise had to pay their own expenses. Writers like Iowa Poet Laureate Mary Swander, U of Nebraska distinguished professor Allison Hedge Coke, slam champion Richard Cambridge, Seattle University writer-in-residence Judith Roche and others flew to Wisconsin in September, 2005, to begin three-year appointments as Fellows to the new Black Earth Institute. Over those years, during the annual BEI intensive, Fellows met with volunteer Scholar-Advisors who include Manitowoc historian Kerry Trask and Aldo Leopold Fellow Cristina Eisenberg, applying themselves to a variety of topics ranging from the philosophy of George Lakov and the influence of the Great Awakenings, to chaos theory and mirror neurons. One former Fellow describes the meetings as “a combination of slumber party and doctoral seminar.” Fellows share rooms, trailers, and tents on the Black Earth property. Every day, they harvest garden vegetables, prepare meals to share, and grow rowdy around evening bonfires while sipping wine from the vineyard that we painstakingly cultivate. During the day, they discuss the assigned readings, which always include scientific information as well as philosophic and literary theory. This year’s theme, “Hope and Resilience,” focused on the question of how to maintain hope in a period of climate change, where millions of the world’s most impoverished people are in danger from rising tides and food shortages. Soil scientist Liam Heneghan and clinical psychologist Arieahn Matamonasa, both of DePaul University, discussed the concept of resilience as it is found in biological communities and within the human mind. Wolf researcher Cristina Eisenberg, formerly a Fellow of the Adlo Leopold Institute, discussed the concept of “panarchy,” and how resilience is a theme that weaves together both science and the arts. Visiting scholar Curt Meine, Aldo Leopold’s biographer and a consultant at the International Crane Foundation, introduced the philosophical and spiritual ramifications of hope. And sociologist Mary Jo Neitz of the University of Missouri presented ideas on how social institutions can promote or discourage optimism and activism. In response to each, Fellows reflected in conversation, writings, and even ritual on the ideas presented. Between the meetings, Fellows and Scholars present panels on BEI’s philosophy at national and regional meetings: Associated Writing Programs, American Academy of Religion, Association for Study of Literature and Environment, Split This Rock activist poetry festival, Iowa’s Wildness Symposium, and others. They have germinated individual projects such as Swander’s Farmscape, a play derived from oral histories of Iowa farmers, and Annie Finch’s Wolf Song, the first production of the new Poets’ Theater of Maine, founded in response to ideas from W.B.Yeats on theater and activism, presented at BEI. Several have returned to school to add additional advanced degrees to their resumes, while others have added new themes to their ongoing work, as Judith Roche did in creating a series of environmental poems for Seattle’s new water treatment plant. At the core of BEI’s work is a commitment to acknowledging that art has not always been a form of commerce. BEI reminds us of the position of the artist as a mediator between humankind and the realms of the gods, the ancestors, or the earth itself, found in most traditional societies. In today’s world, where religion is often a source of conflict, BEI’s artists offer a model of inclusive spirituality, which is always connected to BEI’s other two motivating values, social justice and environmentalism. 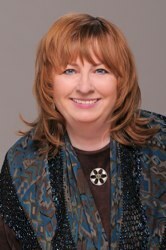 Fellows over the past six years, in addition to those already named, have been: Deborah Wood Holton of Chicago; John Briggs of Massachusetts; Linda Hogan of Oklahoma; Brenda Peterson of Seattle; Patricia Spears-Jones of New York; Regie Gibson of Boston; John T. Price of Nebraska; and Elizabeth Cunningham and Cait Johnson of the Hudson Valley. Seamus Cashman of Ireland has served as International Fellow as well.